Gastronomic Adventures – Fressen and BarChef – vegan in your city. It’s been non-stop exciting eating lately. A combination of long workdays, family visiting from out of town, curiosity about new places, and over all, just general laziness has contributed to our recent culinary adventures. I’m aiming to try and work in some home cooking soon. I miss making meals, but once I get home, I’m just… tired. Excuses excuses. I’m lazy, the end. Anyway, we went to Fressen and BarChef last Friday, and collectively it was just wonderful. amazing. and a string of other various positive adjectives. Our server was friendly. This isn’t exactly a common experience dining in Toronto, so it’s important. Yes. Friendly. 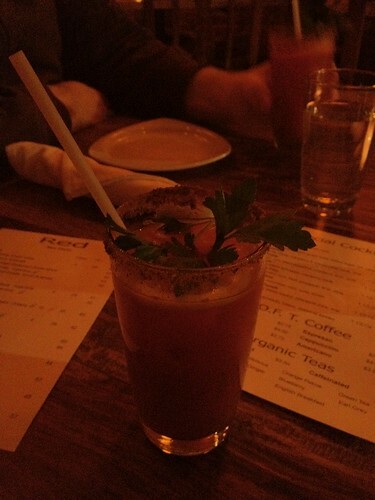 We started with very awesome drinks (this may have aided the rest of the meal), vegan Ceasar. Absolutely delicious. Spicy, salty, with a good rim. JC, having had real ceasars before (unlike me) said that it “was a good ceasar, but it wasn’t great”. I have no point of comparison, so to me it was just a great drink. We ordered the Eggplant Manacotti and Spinach Blini as our appetizers. The eggplant manacotti was an easy favourite. Thinly sliced seared eggplant turned into little rolls of crumbled tofu, sun dried tomato and hearty basil pesto, drowning in an herbed tomato puree. There is a great picture of it on Fressen’s website. Mine was completely too dark to bother sharing. I was less enthusiastic about the spinach blini. Spongy weirdness (the blini) didn’t do it for me. 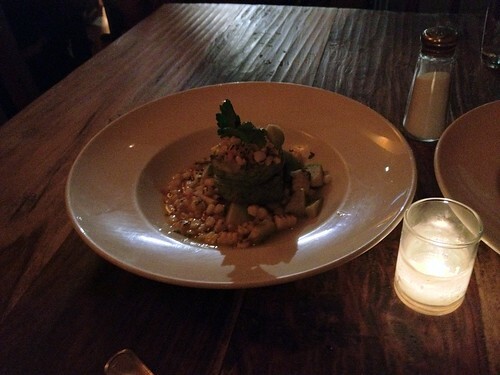 The avocado and corn salsa were great however – but as ingredients those win always. The one thing JC and I noticed and liked was that the corn salsa appeared to have roasted corn kernels sliced off the cob. That is a great touch. 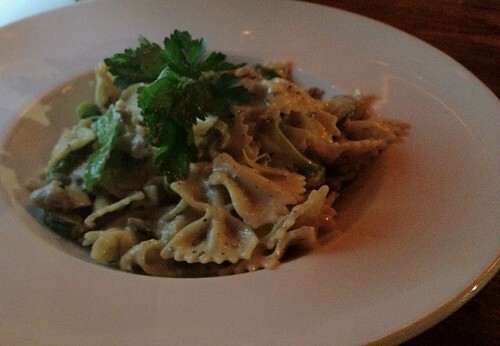 JC ordered the pasta special which was farfalle with cashew cream sauce. It was okay, but (conveniently) I was more into what I ordered. Crusted tofu, with greens and sauteed veggies. It tasted surprisingly good. Tofu is often so boring, but this was fully smoked through. There was a big slice of slightly steamed jicama, but they had the good sense to put small perforations into it. Otherwise, that stuff is impossible to slice into. 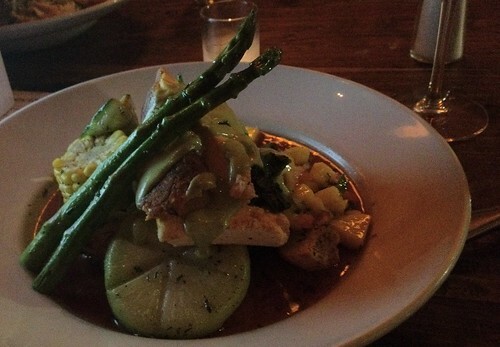 I liked the presentation, especially with the large sprigs of asparagus. A half bottle of 2010 Buenas Ondas Malbec paired well with our meal, but didn’t seem to last long enough. As usual – the one dessert of Fressen was a chocolate terrine. At least they make up for their lack of dessert selection, by making a damn good one. 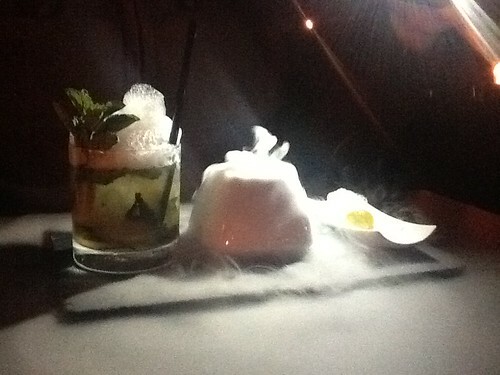 When JC checked into Fressen on Foursquare, one of the tips that popped up suggested we go to BarChef. I never heard of it before then, but it was just two doors down, so we decided to check it out. A SUPER friendly, hyper, server greeted us. Maybe it was just the wine metabolites flowing through my veins, but I liked her cheerful disposition. We flipped to the page with “molecular cocktails”. 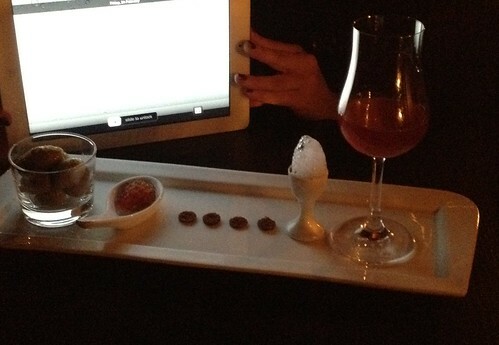 Expensive drinks, ranging from $25-$45 for one. I couldn’t help but think… why? But then I tried one. 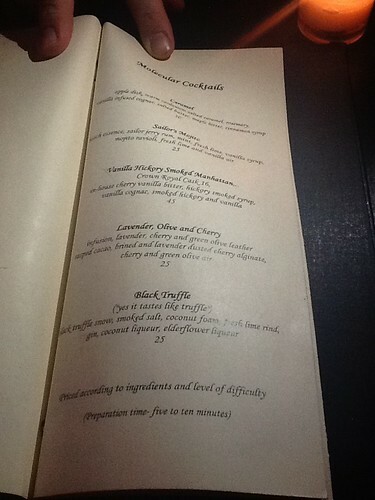 We were conveniently limited to only three of the molecular cocktails, as the other two contain either egg whites in the coconut “foam” or dairy in the form of salted butter or caramel. So Sailor’s Mojito, Vanilla Hickory Smoked Manhattan, and Lavender, olive and cherry. I ordered the Lavender, Olive, and Cherry. The consumption of which was a great process and experience. Different infusions of alcohol mixed together for a glass of high alcohol content, a rasped cocoa, brined and lavender dusted olives, cherry alginate spheres, and cherry and green olive air with it’s own bigger drink spherification/”ravioli”. In this picture you can also see an alternative to using flash in a restaurant, while still being slightly annoying to other patrons. But in case you’re wondering, if you’re looking for a vegan snack at BarChef – don’t bother. According to the chef, they don’t have anything on the menu that’s vegan. Including the stuffed olives or even the frites (I assume due to the aioli). Hopefully experiments will be forthcoming. As Lagusta said perfectly in an entry about Alinea restaurant in Chicago. vegans should be embracing this molecular gastronomy business. It’s so vegan friendly. It uses tools we’ve been using forever (agar, kuzu, flax seeds, various powders and elixirs), but it uses them unapologetically, not as “replacements,” but as interesting elements of a dish on their own merit. Seriously. This is amazing. Why haven’t I made more of an effort to do this stuff? Random stop at BarChef, leads to additional inspiration and a push to create more. This is what it’s all about. BarChef, Fressen, Molecular Cocktails, Molecular Gastronomy, toronto, Vegan fine dining. Bookmark. Niagara Falls, the Guru, & Being a Tourist with my Mom. I figured out what the caesar was missing – a long vegetable. Celery, a green bean, something! The other bits in the pasta were sensational – I think you missed out on them, because I kept them to myself! I could see the appeal of a brined long bean… or maybe a giant celery stalk. But really anything salted and picked would have made something already tasty even tastier. mmmm. You’re totally right. This is a great idea.